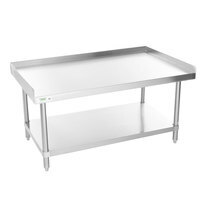 Store your business's heavy countertop equipment on this Regency 30" x 48" all stainless steel equipment stand. 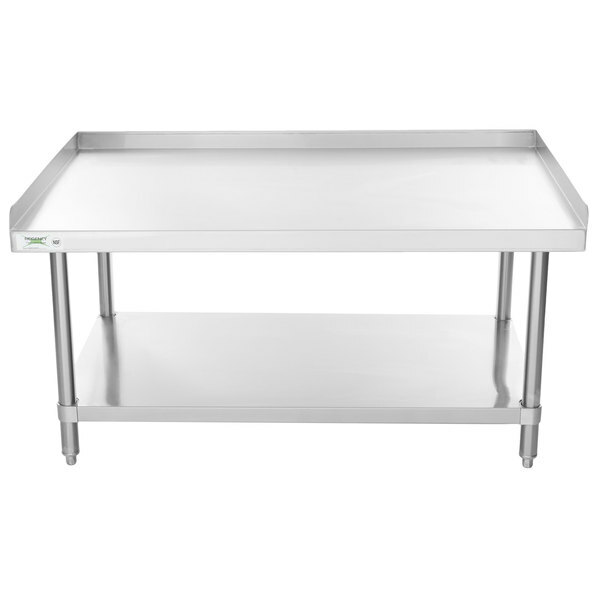 This Regency 30" x 48" stainless steel equipment stand is built to hold up to daily use in even the busiest commercial settings! 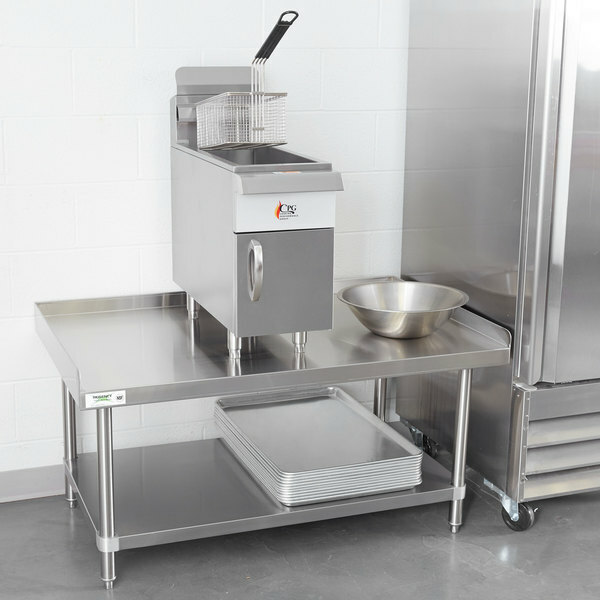 Its durable stainless steel construction, impressive weight capacity, and additional undershelf make it the perfect choice for storing both your equipment and the supplies that come with it. 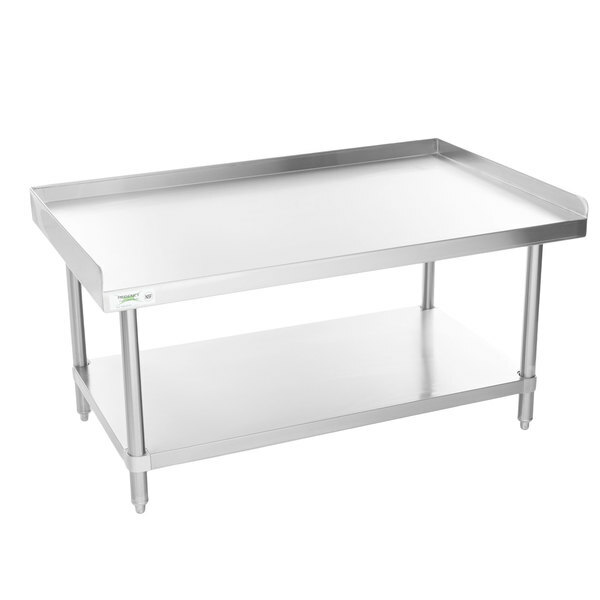 This long table is capable of holding multiple griddles, mixers, and other essential pieces of kitchen equipment! "This is great equipment stand, all stainless steel, looks clean. 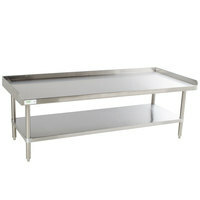 very sturdy, great for prepping at our restaurant. 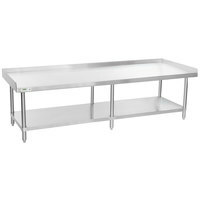 also great pricem cant beat the price"
This Regency equipment stand features a durable 16-gauge type 304 stainless steel top shelf that can support up to 900 lb. 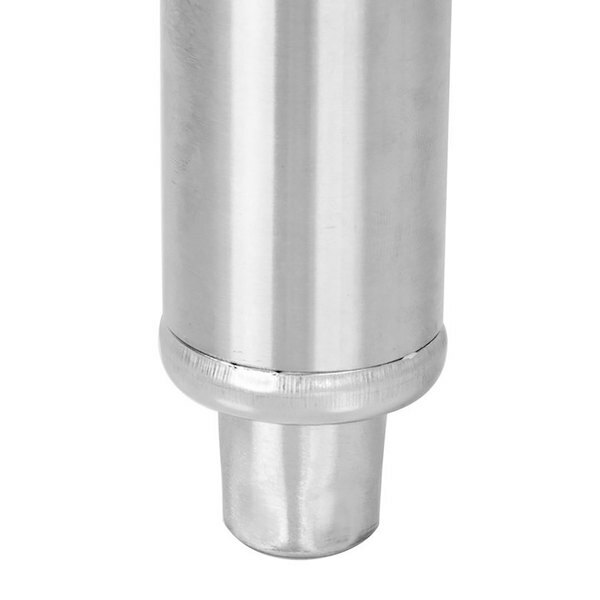 of evenly distributed weight, making it well-suited for holding up slushy machines, beverage dispensers, and soft serve ice cream machines! It's ideal for malt shops, snack stands, delis, bakeries, and much more! 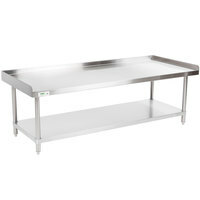 The 18-gauge type 430 stainless steel undershelf can hold up to 700 lb. for storing additional equipment and supplies. 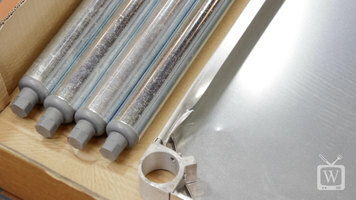 For added security, a 2" edging comes standard to help keep equipment and other contents from sliding off and becoming damaged. The legs of this Regency stand are also constructed of durable, easy-to-clean stainless steel to provide commercial-grade toughness. This stand ships unassembled to save you on shipping costs. An allen wrench and two set screws are included for easy assembly. 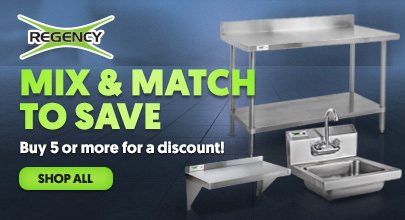 In this video, learn how to assemble your Regency stainless steel equipment stands! Also, how to adjust the height of the stands and how to add casters to them! Check it out! 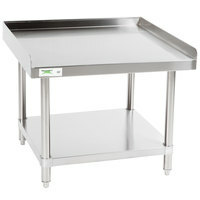 Our Regency stainless steel equipment stands are a great choice to hold the counter top equipment on your cooking line. These stands are shipped to you unassembled in order to save you money on shipping. Today I’ll show you how easy it is to assemble these Regency equipment stands. First let’s take a look at the parts that come inside your box. You have the equipment stand top and you’ll see it has a 2 inch splash on three sides to keep your equipment from slipping off the stand. You have an under shelf, four legs and you’ll find a bag in the box with your legs that contains an Allen wrench and two extra set screws. The rest of the set screws are already screwed into where they belong. Note the protective film on the top of the stand and the under shelf. I recommend that you leave this on the stand until you’re finished assembling, that way you prevent scratching and scuffing. And keep in mind that especially with larger stands, having a helper can really come in handy. To assemble, first place the equipment stand top upside down on a surface that won’t scratch it. Here I’m using the cardboard box it arrived in. Next, place the four legs in the tabletop gussets. If one has trouble going in, you may have to give it a few turns to the set screws to loosen them. Now, tighten the set screws. At this point, I don’t tighten them quite all the way since I like a little bit of play when I’m adding the under shelf. To add the under shelf, which not only gives the stand extra storage but also stability, you’ll first want to decide what height you’ll want it and then mark that height on all four legs. 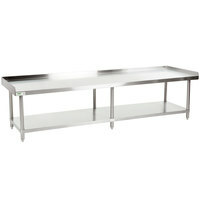 In any food service application you’ll want that height o be at least 6 inches off the ground for food safety reasons. Once marked, slipped the under shelf onto the legs to the proper position. Work your way around and tighten the two set screws for each leg. Now tighten the set screws at the tops of the legs. The equipment stand assembly is almost finished, but before I flip it right side up I wanted to show you the adjustable feed on these equipment stands. 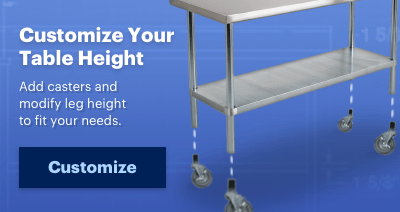 Whether you’re putting the table on an uneven surface, or just need to raise it or lower it you’ll appreciate that simply by turning the foot you can adjust the height by up to an inch and a quarter. Do you need casters for you equipment stand? 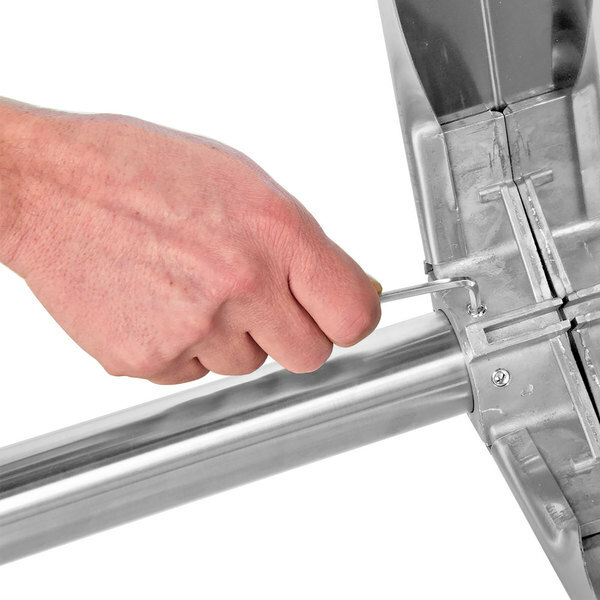 Use our cut down feature in order to both shorten the stand to allow for casters and to buy the casters themselves. Thank you for watching, and if you have any questions please feel free to use our live chat button. We are very happy with this equipment stand. We set our microwave and two burner unit on top. 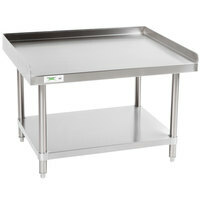 Having the lower stand makes it much easier for employees to use larger pans and be at arms level for stirring. 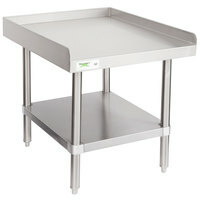 It is definitely sturdy and safer than using a regular prep table as a stand. I like design. It can be anything you would like it be. We use it for bowls preparation and for soup pot. It is useful. This is a great stand. Heavy Duty. Nice looking and very strong. Great for Griddles, Grills or whatever you need. I use it for my 2-24" Griddles. Definitely recommended. I've had this table for almost a year now and it has held up great. I use it to hold my griddle. I wrap it with foil to keep it clean. I love the shelf at the bottom because that's where I keep my cleaning products.